Aside from the inevitable exhaustion that comes with staying up to watch a bunch of late night games in the middle of a work week, the most notable part of the Caps’ West Coast road trip thus far has been the play of Washington’s opponents. Both Anaheim and Los Angeles operate in a manner that is almost entirely foreign to Caps fans this season: They try. Really hard. This is not to say that success in the NHL is predicated solely on hard work: Both the Ducks and the Kings are supremely talented hockey teams. And this is not to diminish the importance of whatever system, or structure a team plays within: There’s no denying that the Kings’ commitment to collapsing and shot-blocking has a lot to do with the fact that they’ve allowed the fewest goals in the league. But there are lots of teams that have talent, and there are lots of teams with good systems in place. What makes the Ducks and the Kings so unique is the relentless, and at times overwhelming manner in which they employ their talent, and execute their systems. Sure, there were times during these past two games when the Ducks and Kings didn’t look all that impressive. Like most games in the NHL, the momentum swung back and forth; in neither game were the Caps wholly outplayed. What never changed, however, was the compete level: The Ducks and the Kings never stopped working. The Kings, for instance, are the best puck-possession team in the league, and it’s not just because they’re talented, and big; it’s because they never stop pursuing the puck. To their credit, the Caps have been pretty good too. Against some long odds, they have traveled West, their playoff hopes hanging in the balance, and have held their own against two of the best teams in the league. Frankly, if they played every game the way they’ve played the last two, their postseason chances wouldn’t be in such jeopardy. Unfortunately, however, they don’t. The Caps’ have some objective deficiencies in talent—particularly on the back end—but their biggest weakness is the inconsistent effort that they put forth on a nightly basis. From game to game, and from shift to shift, it’s never a given which team you’re going to get. They can play with the best, and even dominate at times (see the first half of the March 1st game against Boston as an example). But they can also sleepwalk through long stretches, sometimes looking almost bored (see the second half of the March 1st game against Boston as an example). Say what you will about the inexperienced defense, and the insufficient scoring depth, but there are only so many times that you can watch the top line lose a battle along the wall before it dawns on you that maybe the other team is just trying a little bit harder. Now, I should qualify this argument by mentioning that I watch very little of the Kings and Ducks (those West Coast start times are a killer). 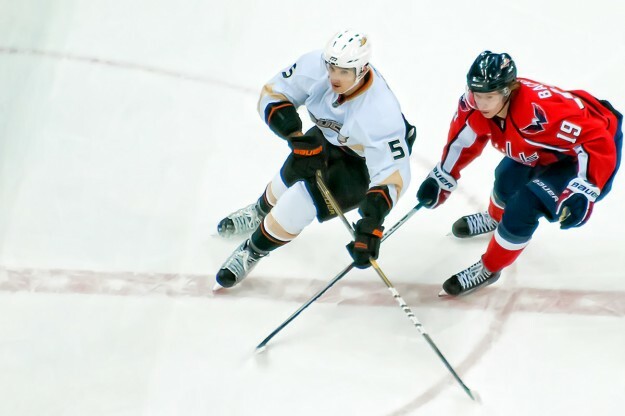 It’s very possible that these two games were mere aberrations, and that they, like the Caps, go through periods—or weeks—where they look plainly disinterested. Judging by their records and recent success, however, I would bet that’s probably not the case. If the Ducks or the Kings find themselves in the Stanley Cup Final this Spring, it will be because they’ve outworked everyone else, just like they have for most of the season. And if the Caps manage to sneak into the first round, it will be because they play these final 11 games as if they were the Ducks or the Kings.